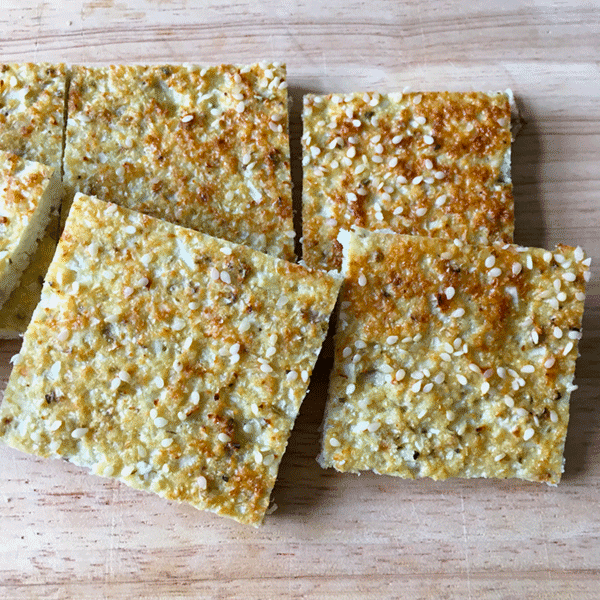 This recipe for cauliflower ‘flatbread’ is perfect for people who are trying to cut down on bread and especially good for those on a gluten free diet. It is easy to make and really versatile. The ‘flatbreads’ can be gently warmed and served with avocado or poached eggs or enjoyed with dips or curries. Once you have made them a few times you might like to experiment by adding different flavours to your ‘bread’. I’d love to hear how you get on! Place the cauliflower in a food processor and blend until you have a fine rice-like texture. Add the ground almonds, season generously with salt and pepper (plus herbs, if using) and mix with your hands. Add the eggs to the cauliflower mixture and mix well with a spoon or your hands until you have very loose dough. Transfer to the baking tray and spread the mixture evenly to form a rectangular base by flattening the dough with your hands or a spatula. Bake on the middle rack in the oven for 23-25 minutes or until slightly golden and firm. Turn it upside-down and very carefully remove the baking paper. Cut into squares, fingers or triangles. Stores in the fridge for a few days. Before putting in the oven you can sprinkle sesame seeds into the mixture. If enjoying with curry or Middle Eastern dishes, try a pinch of cumin in the mix, then sprinkle with Nigella seeds before baking. You can also use a large head of broccoli instead of the cauliflower.